Could your dog be the next social media sensation? 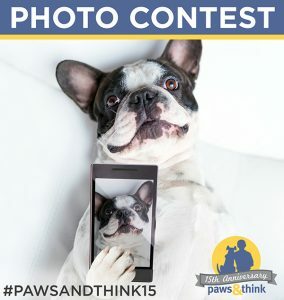 Submit your pup’s best photo to the Paws & Think 15th Anniversary photo contest! One randomly chosen winner will have their dog’s photo displayed on the Paws & Think website, Facebook, Twitter, Instagram, and in the next edition of the e-newsletter. In addition, the winner will receive a gift package with goodies for both human and canine – including a Paws & Think branded shirt, travel mug, bag, treats, toys, and Frisbee. The last day to submit your dog’s photo is Sunday, November 27th, with the winner being announced on Monday, November 28th. So start snapping away! We look forward to seeing your pup’s best pose.